(St. Paul) – March 15, 2016 – Nurse members of the Minnesota Nurses Association reported more than 2,700 incidents of unsafe staffing in Minnesota hospitals last year, according to a qualitative study released today at the Minnesota Nurses Association’s annual lobby day in St. Paul. These incidents are reported in Concern for Safe Staffing (CFSS) forms that nurses file in unsafe situations. The report issued today showed nurses filed 32.93 percent more CFSS forms in calendar year 2015 than they did in 2014, which totaled 2,062 incidents. MinnesotaCare is dropped all together. This is the insurance program for about 90,000 Minnesotans who make too much money for Medicaid but not enough to buy insurance through an exchange (approximately 134-200% of the Federal Poverty Level or about $40,000 for a family of four). Another bill, HF 848, includes tax credits for those dropped from MinnesotaCare to get coverage through the private market or MNsure. Unfortunately, the proposed credits aren’t nearly enough to provide an equal level of care. 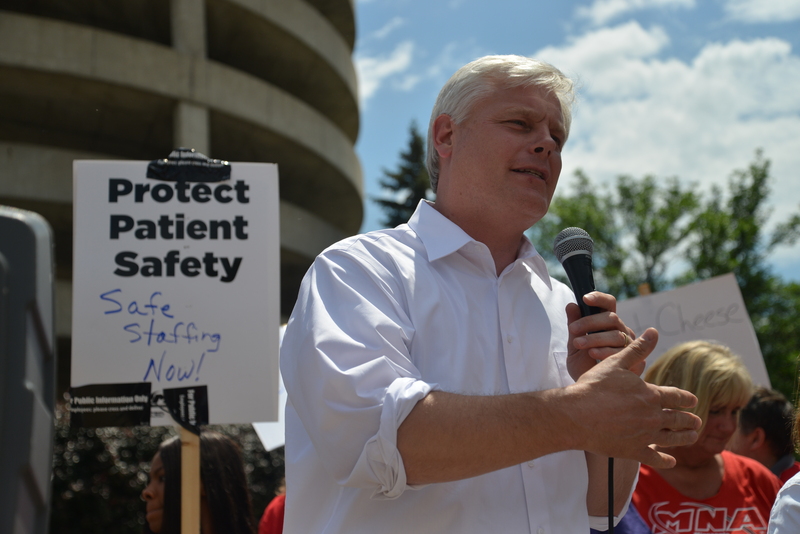 Minnesota Nurses fighting for safe staffing levels for patients held an informational picket on Tuesday, June 24, 2014. Legislative leaders from the area joined them to echo their concerns that patient safety is a concern. In response, NNU has launched a major campaign featuring radio ads from coast to coast, video, social media, legislation, rallies, and a call to the public to act, with a simple theme – “when it matters most, insist on a registered nurse.” The ads were created by North Woods Advertising and produced by Fortaleza Films/Los Angeles. 2014 is an important election year for nurses and the communities we care for and live in. The entire Minnesota House of Representatives is up for re-election, as well as the Governor, U.S. Senator Franken, all eight members of Congress and countless local races. These elected officials make decisions about nursing and health care that affect our profession, our patients and our families. We must speak up for nursing values of caring, compassion and community. If we don’t advocate for our patients and our profession, no one will. Start out by attending your party’s Caucus Night, Feb.